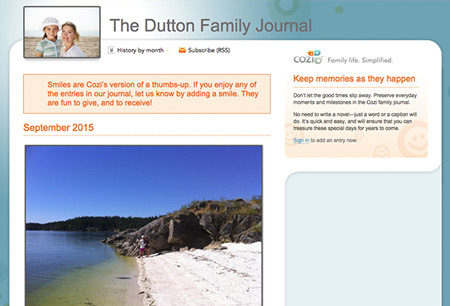 Use the Cozi Family Journal to jot down important moments and more, before you forget them. In no time at all, you will have effortlessly created a rich family history. From the Journal, click Jot down a moment. Add a photo and/or text (if you add text, the first part of your entry will appear in bold as a title). Select Shared or Private. Private entries will only be visible to family members in your account. Shared entries will be included in newsletters and/or webpage sharing if you choose to use these features. From the Journal, tap + to add a story. Add a photo and/or text. In Journal, click Send by email. Select the option to Send monthly email newsletters, then follow the prompts. Note: The newsletter will be sent on the first of each month, as long as there are shared entries for the previous month. For example, if shared entries are added to the journal in March, all recipients will get the newsletter on or around April 1. In Journal, click Shared journal options. Select the option to Share as a webpage. Follow the prompts to set up your own family blog.